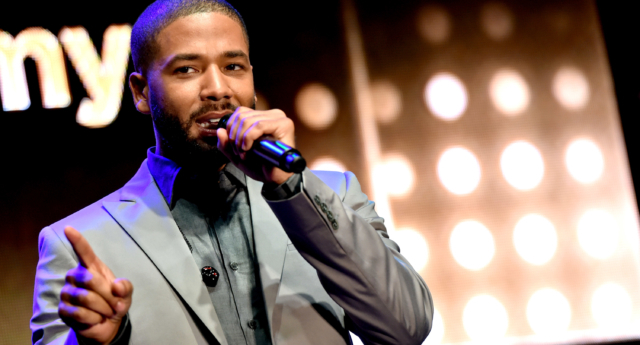 Empire actor Jussie Smollett has spoken out after he was the victim of a reported racist and homophobic attack in Chicago. Police have released CCTV stills of two people they are seeking to speak to in connection with the attack, with the FBI also assisting in the investigation. Smollett spoke out about the incident for the first time on Friday (February 1) in a statement to Essence. He wrote: “Let me start by saying that I’m OK.
“My body is strong but my soul is stronger. More importantly, I want to say thank you. Smollett also addressed “frustrations and deep concern with certain inaccuracies and misrepresentations that have been spread,” a possible reference to alt-right conspiracy theories and misinformation surrounding the attack. He added: “I am working with authorities and have been 100% factual and consistent on every level. “These types of cowardly attacks are happening to my sisters, brothers, and non-gender conforming siblings daily. “I am not and should not be looked upon as an isolated incident. We will talk soon and I will address all details of this horrific incident, but I need a moment to process. The statement issued on Thursday (January 31) by the Smollett family said: “Our beloved son and brother, Jussie, was the victim of a violent and unprovoked attack. The family continued: “We want people to understand these targeted hate crimes are happening to our sisters, brothers and our gender non-conforming siblings, many who reside within the intersection of multiple identities, on a monthly, weekly, and sometimes even daily basis all across our country.